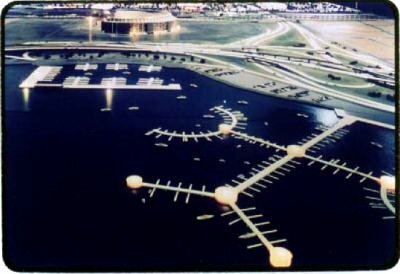 One of the things that Robert Moses and his associates had learned early in their careers was that if you wanted to build something really big one important way to garner support for the project, as well as to assist the builders during the planning stages, was to commission a very detailed model. Never was this truer than for the models that they had built to both illustrate and publicize the New York World's Fair of 1964-1965. And according to Moses, the self avowed model man per his own notes in the Fair records, there was no better way to attract exhibitors to the Fair and build excitement with the public than to have a large and dramatic visual representation of what great and exciting things were coming to the Fair. The model which ultimately came to be referred to as simply "the big model" became the responsibility of Deputy Director of States Exhibits Mike Pender on January 3, 1961 by a memo issued by Robert Moses. But the story of the model began much earlier than that with the original proposal that Lester Associates, Inc. made to the Fair Corporation on August 3, 1960 in which they state that the basic model map (not including any buildings) would cost $40,500 to build. As soon as the Fair took possession of the model, the almost constant updating of it to reflect the changing landscape began immediately. As new exhibitors signed their leases the selected plots were marked on the big map to indicate where they would be located. The map itself was color coded similar to the later official published maps of the grounds to indicate the five different exhibit areas of the Fair along with roads being marked in brown and park areas in green. From early 1961 until early 1964 Mike Pender was charged with the task of communicating with Lester Associates to obtain bids for the building and installation of the various structures in miniature. As plans were announced Mr. Pender would then work with the engineering and publicity departments of the Fair to obtain the drawings, sketches, specifications and artist renderings of the buildings to provide to Lester to bid the work, and for Lester's artists to ultimately use in constructing the accurate representations of the structures. Once Lester received this information they would provide a bid to the Fair which would be reviewed and approved by Mike Pender prior to work commencing under a standing contract that they had with the Fair. At regular intervals time would be reserved for Lester's people to have exclusive access to the model room to install the new or updated structures on the big model. The flow of information back and forth between the Fair and Lester was continuous as new leases were signed, exhibitors' building plans announced, revised or ultimately scaled back and even sometimes dropped from the Fair. Once a lease was signed usually a small plaque would be placed on the corresponding lot on the model. Then as exhibitors formalized their building plans those details would be provided to Lester to build a scale model of the pavilion in miniature. The typical cost of rendering each of the pavilions usually cost less than one hundred dollars for the smaller ones such as SKF or Morocco. The slightly larger pavilions such as Illinois or New Mexico typically cost one to two hundred dollars. The really large exhibits such as IBM or GE would routinely cost between three and five hundred dollars each to build. One unusually complex model was the Chrysler pavilion which ended up costing the Fair the sum of $921 initially plus another $215 for changes when they ultimately finalized their pavilion designs. Installation was extra and billed based on the actual hours spent on the big model doing the work. An example of the great attention to detail was whether to build an animated or stationary version of the Monorail. Lester estimated that to build an animated version would cost $800 whereas a stationary version would only cost $350. After some discussion back and forth as to the importance of this exhibit it was ultimately decided that the animated version would be built and so it was ordered. One has to keep in mind that all of these amounts are in early 1960s dollars so they were no small sums even back then. Another interesting story that illustrates how seriously the Fair and ultimately the exhibitors viewed the importance of the big model and its timely, as well as accurate, representation of their plans is reflected in the communication back and forth between the CEO of the Parker Pen Company and the Fair. After a visit to the model room the CEO was quick to dash off a letter to Fair officials demanding that they immediately update the model. He most emphatically stated that he felt that they had already had an adequate amount of time since Parker's participation announcement to update the model with their exhibit building as well as the narration that the hostess provided to visitors. Of course the Fair responded quickly that they too felt this was of the utmost importance and expected that within no more than eight weeks, or sooner if possible, the necessary changes would be made. 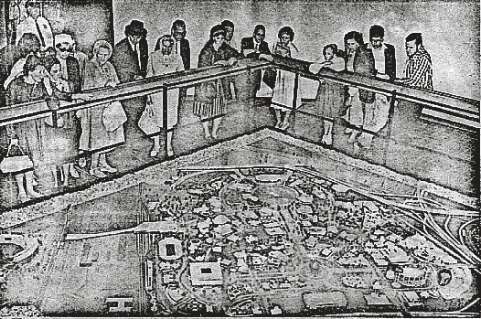 The big model was also the only place that some of the unbuilt pavilions at the Fair would ever be seen. This included the infamous World of Food pavilion at the main entrance to the Fair, the American Indian pavilion and the Graphics Arts pavilion to name but a few. One of the most notable and well documented ideas which never came to fruition was the Arch of the Americas. 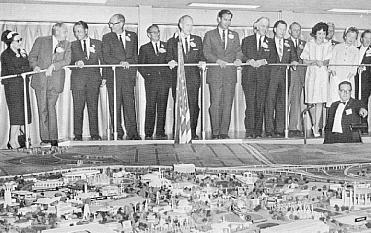 It appears that as early as April 2, 1963, Owens Corning, which was involved with Marinas of the Future in building the World's Fair Marina, was very interested in acquiring their own full scale version of the big model to display in their showroom in midtown Manhattan. They were duly referred to Lester who quoted them the tidy sum of $60,000 to build a basic flat model which included only sixty-three of the pavilions designed and built to date! If they wanted the model with the same contours as the actual Fair site the cost would increase by another $7,500; with sound, another $5,000 on top of that. There is no indication that this version was ever built. But what did come out of this discussion was their interest to be involved with the Fair on the same level as that of US Steel. To that end they proposed building an arch entirely out of fiberglass and for them to receive, in return, a considerable amount of publicity at Fair expense for sponsoring the construction. For a short period of time this idea intrigued officials including Moses who went as far as to direct Mike Pender to have a miniature model of the arch designed and built for the big model to see how it would look. While it does appear that the model arch was built and actually placed on the model its display there was short lived. This was due in large part to the Fair's unwillingness to provide the requested level of publicity for the arch for Owens Corning as they did for US Steel. So the arch came off the model as quickly as it went on. The model was truly a "working model" and was changed all the time. Black placards with the name of the pavilion, along with a cut-out "footprint" of its plot, represented the exhibitor until a model could be constructed. Site cut-outs were color-coordinated by "area" of the Fair (you can tell the orange International Area plots from the gold Industrial Area plots at-a-glance, etc.) This photo is a good example of how the model changed. The archway in the lower center of the picture is "The Arch of the Americas" that was never constructed. The model was removed when plans were dropped. Likewise, the building in the center of the photo with the cantilevered four-point roof is called The World's Fair Assembly Building. It became known as the World's Fair Pavilion and took the shape of a geodesic dome. The dome would replace the four-point building in later photos of the model. When the model was originally built the structures were not lit from within. As time progressed Moses decided that the big model needed a very elaborate lighting system to highlight each structure individually or in groups corresponding to the five sections of the Fair. At the same time parts of the model were also painted using phosphorescent paints to simulate what the Fair would look like at night. This elaborate retrofit alone cost in excess of $5,000 to complete and included the addition of black lights in the ceiling above the model to simulate a night view. As more and more buildings were completed the lighting system had to be upgraded to meet the power demands for all of these lights. This was accomplished by adding more powerful transformers under the model. The lighting effects were controlled from what can best be described as a complex switchboard mounted on one side of the model which the operator could switch on and off in various combinations to produce the desired effects. All of this lighting caused an unforeseen problem in the close quarters of the model room. An incredible amount of heat would build up under the model if left fully on for long periods of time. This became quite apparent one day when a small wisp of smoke was noticed coming out from the underside of the model! Alarmed, Fair officials promptly summoned Lester down to the Fair site to determine what was causing this very worrisome problem. Their inspection of the underside of the model revealed that poor ventilation was allowing the steady build up of heat from the continuous operation of the lights. This excessive amount of heat was overloading the circuits and thus causing them to smolder. Lester promptly recommended that more vents and some small fans be added at various points along the skirt lining the model to improve air circulation and that a timer be added to the light board so that after a certain period of time the lights would automatically shut off if left unattended. Most importantly they chastised the Fair for storing various items underneath the model which they felt was a serious fire hazard. The Fair Corporation swiftly agreed to these recommendations. Thus the model was saved from its own imminent and what would have been a most untimely demise. On March 24, 1961, General Potter indicated that Moses had approved the spending of $8,000 to build a 3'9" replica of Unisphere by an unknown firm on the west coast of the United States. This model ultimately had its own separate display area in the Administration Building surrounded by a curtain backdrop and a railing to keep visitors from getting too close to it. Access to this room was very tightly controlled with strict instructions to the World's Fair Maintenance personnel that they could clean everything around and attached to the model but that under no circumstances were they ever to actually touch the model for any reason. The records do detail though how it was once moved to be photographed and filmed by US Steel for publicity purposes prior to the opening of the Fair. The memo goes on at length as to what care was to be used in its handling during the move back and forth from a conference room where the shoot was to occur. Also of interest is the mention of how a study was done using this same model to determine that to have lighted and moving satellites on the three orbit rings of the real Unisphere would cost anywhere from $100,000 to $150,000 to design and implement and that such a cost would not be practical. This very novel idea died a quiet death. Just as interesting though, the records do not detail whatever happened to this very elaborate and expensive model of the Unisphere after the Fair. What is also interesting to note about the big model is that while it was not actually finished until early March 1964 it was at the same time in great peril of being put in storage or worse yet destroyed unless another suitable location could be found to display it in. This was because as the Fair administration staff grew in size so did their need for suitable and conveniently located office space. The biggest group in need seemed to be the accounting staff which was growing exponentially along with the Fair. Since the accountants obviously were not model men one of the first places they decided to look to take over was the model room. And so through a good part of 1963, while work still continued on the model, one group of Fair officials was plotting and scheming against the model while another group was feverishly working on a plan to find a suitable permanent home for what was now a very elaborate and very expensive rendering of the Fair. Early during this process it was proposed that a small sponsored pavilion be built at the main entrance to the Fair and that the model would be lent to that sponsor free of charge to display in this unique building. The model would serve as the focal point of the exhibit to help orientate visitors as they entered the Fair. Fair officials went as far as to commission a structure designed by no less than Edward Durell Stone that can best be described as a very graceful ribbed wing-like permanent structure that was to be set below grade. 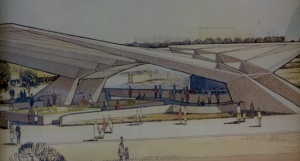 A picture of the rendering of this proposed structure exists in the records and was obviously shown to prospective sponsors to entice them to participate in the Fair. Fair officials estimated that such a building would cost anywhere from two to three hundred thousand dollars to build not including outfitting the sponsors own exhibit space and staffing it. They also indicated to all prospective exhibitors that while use of the model would be offered most generously free of charge, the moving of it would not be free and as such anyone interested in this idea would have to bear the entire cost of moving the model out of the Administration Building and into its new location. William Berns, who was in charge of publicity for the Fair, made this one of his pet projects to bring to fruition and Moses gave him until July 1, 1963 to get it done. During that time the lead contender to sponsor the pavilion was CBS. A constant stream of unsuccessful correspondence, which included invites out to the Fair site, was directed personally to William Paley who ran CBS. At the same time at least a half a dozen other companies, including Eveready Battery and Wonder Bread, were contacted as possible sponsors all with no success. Proposed pavilion designed by Edward Durell Stone that would display the model of the Fair. No sponsor was found and the structure was never built. RCA was also approached to add the model to their pavilion but they quickly indicated that at this late stage it was not possible to modify their pavilion to accommodate it. Things were actually starting to look desperate as extension after extension was granted until, at almost the last minute, Mike Pender somehow convinced American Express to take the model. In a handwritten note at the bottom of one memo Bill Berns marveled at how Mike pulled it off and promised to take him for a steak dinner in the restaurant of his choice for saving the day! And so a deal was struck with Amex for delivery of the model to occur no later than March 1, 1964. But the model was not out of the woods yet since even at this late stage it was far from complete. In the waning days of 1963 and early 1964 there was a flurry of activity between Mike Pender and Lester Associates as they worked closely together to get the last of the buildings completed and installed on the model in preparation for its delivery to American Express in its final form. Then to add insult to injury, once the model was completed, it was discovered that a small portion of the original outlying land areas around the Fair had to be removed and put into off-site storage by the Fair Corporation never to be heard from again. This was due to the space limitations for the model at the Amex pavilion. What the Fair's records don't indicate is what ultimately happened to the big model after the Fair. While there were a few pieces of correspondence mentioning various ideas to move the model back to the Administration Building, the New York City building, the Hall of Science and even the Press Building after the closing of the Fair, there is no real solid evidence documenting that any of these ideas were actually carried out. Another side note to the big model was that Robert Moses, Stuart Constable and General Potter all received mounted versions of various unnamed pavilion models as gifts from Lester for their desks and offices. At the same time, on March 23, 1964, Moses directed that plaster models also be built in 1" to 100' scale and mounted on walnut bases with engraved nameplates. A total of twenty-five of these types of models were ordered. The models which came in white gift boxes were ordered for each of the eighteen state pavilions at the Fair in addition to six of the New England States model because it was a multi-exhibitor pavilion, and one of the US Pavilion, with the idea of presenting them to officials as a memento of their exhibits at the Fair. Lester priced these special models at $30 each. One has to wonder whatever happened to each of these unique models as well. 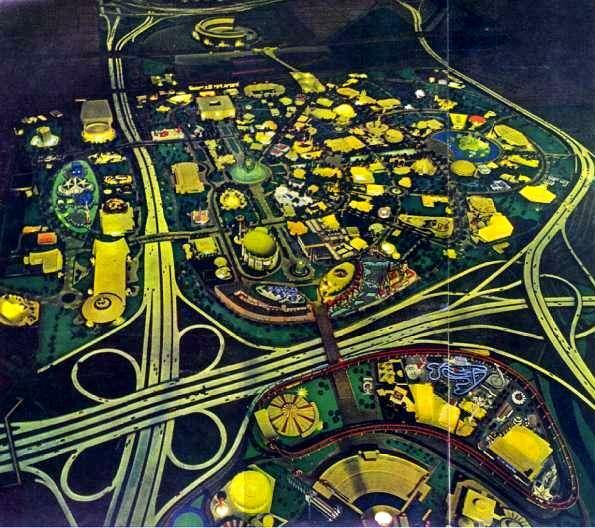 It was decided during the pre-Fair period that in addition to the big model there would also be a number of much smaller but no less detailed versions that would be utilized to promote the Fair. 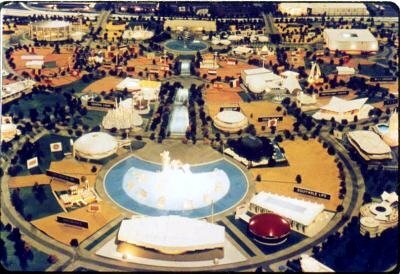 To that end the Fair initially had a grandiose plan to build anywhere from fifteen to fifty of these smaller "traveling" versions of the Fair model, the first of which ultimately cost the Fair Corporation $9,850 to build according to a May 9, 1963 letter from Lester Associates. In that same letter the Fair was given an option to acquire six more traveling models for an additional total cost of $38,600. After paying the cost for the first traveling model though, plans to build more of these table top type models stalled for unknown reasons. 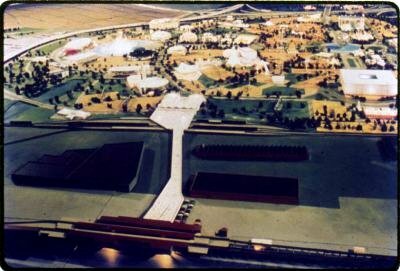 That was until November 19, 1964 when Lester offered to build the Fair another model for $4,948. In anticipation of the promotional needs of the Fair for the 1965 season the Fair duly commissioned this additional version thus giving it two traveling models for its use. During the period between the above mentioned dates Lester also wrote a number of letters to Fair officials trying to interest them in a program whereby Lester would build a number of additional models and then administer a rental program of their own design for these other models. The bottom line of their very detailed proposal ultimately centered on them renting these models out on a weekly basis for the outrageous sum of $200 per week! Fair officials thought just that and told Lester that maybe they could get $50 a week. Thus due to this disagreement on what to charge for the rental program it never got much past Lester building four additional models at their own cost and renting them for an undetermined amount on a periodic basis. Now this is where the story gets interesting because the records do detail exactly what happened to all six of these traveling models after the Fair ended! Fast forward to early 1966 and we find our hero Moses trying to scrape up every nickel he can lay his hands on to finish Flushing Meadows Park. When low and behold the Plumbers Union comes along and offers to buy one of the models for a small but reasonable sum. Moses, ever the shrewd businessman, offers to sell them one of his models for the sum of one thousand dollars. The plumbers being even shrewder than Moses though quickly but politely decline to take him up on his most generous offer since that is a lot of money to pay just so some union delegate can say he has one of the models in his office. Now more time passes and on March 8, 1966, Lester writes to the Fair Corporation and notifies them that since they built the four models in their possession on their dime they intend to keep one for themselves, donate one to the Department of Parks and donate one to the Museum of the City of New York which leaves one model to be disposed of. Knowing that they made a boatload of money off the Fair for the big model, the traveling models and, lest we not forget, The Panorama of the City of New York, they ask Fair officials if they have any preferences as to who should be the lucky recipient of their final model before they decide for themselves. On March 16, 1966, Moses says in a memo to Stuart Constable that he has already decided that the Fair's two traveling models are going to the Long Island State Park Commission and the Triborough Bridge and Tunnel Authority. At the same time he recalls the plumber's request and now realizing that he can satisfy their desire to obtain a model in what can best be described as a declining market for traveling Fair models, he generously tells his associate to instruct Lester to send their last model to the plumbers. And so on March 21, 1966 Stuart Constable wrote to Lester Associates and advised them that Mr. Moses would like them to give the last remaining traveling model to the Plumbers Local Union #1 for their viewing pleasure. 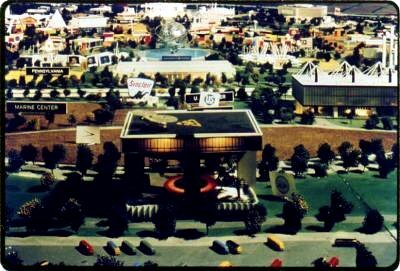 And so goes the saga of the models both big and small of the New York World's Fair of 1964 -1965. The model of the Fair is located in a specially designed room in the Administration Building. it represents an area from Flushing Bay to the Kew Gardens Cloverleaf. The model incorporates all features of the exposition including the Unisphere, entrances, parking fields, bus terminals, fountains, roadways, landscaping, etc. Other features shown on the model include Flushing Meadow Stadium, Flushing Bay Marina, Long Island Railroad, IRT Subway and the highways as they will appear after the improvement program is completed. Scale Models of the exhibit buildings and other features of the Fair are added as plans are developed. Each building and feature can be lighted by means of a specially designed control panel. The kidney-shaped replica of the Fair is fabricated of plastic and wood at a scale of 1/32" to a foot. It has an overall length of 54' 7" and a maximum width of 21' 9". It is mounted on 25 tripod-type 1/2" steel welded legs. The base of the model is enclosed by a plywood covering. Special lighting has been installed in the model room so that the model can be shown as it will appear in sunlight or at night. An adjacent stationary platform has been installed to permit viewing of the model. In the Model Room at the Administration Building, viewing was available at table-top level or via a raised platform. Here, Deputy Director of States Exhibits Michael Pender gives a presentation to a group from Florida attending their state's groundbreaking ceremony. This series of photos give a good overview of the scope of the model and show how the model probably looked in late 1962. This photo is of the Transportation Area with a nice close-up of the Heliport model. 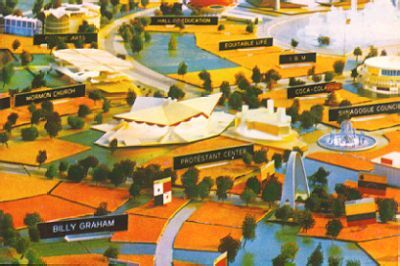 Rectangular pavilion at center right with spikes sticking up on the roof is the original design for the Transportation & Travel Pavilion. Note the placard for the Marine Center at the left (and behind it in the distance a placard for the Pennsylvania pavilion? Both exhibits were never constructed. 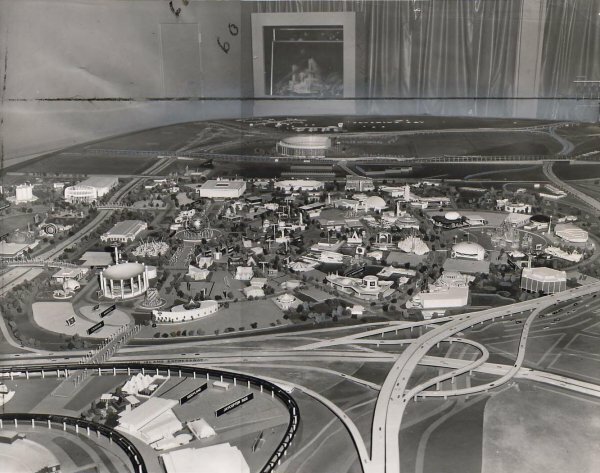 This photo shows how the model detailed the railroad approach to the Fair leading up to the Fair's main entrance. A nice view of the model looking down from the Industrial Area. webmaster's note: Many Thanks go to Craig Bavaro for his excellent research into the story of the models of the Fair! The story of the models is invaluable information documenting an important part of the Fair's history. Thank you for all of the hard work and the fascinating information, Craig! Craig has been a valuable contributor to nywf64.com over the years. You might also wish to explore Craig's excellent memoir titled A World's Fair Odyssey & An Afternoon of Delight about Flushing Meadow Park as it was in the mid 1970s and his well-researched essays from the World's Fair Corporation archives including An Almost Fond Farewell - the story of the decision to save a handful of pavilions after the Fair ended, What to do with All of These Records? - the story of how the Fair's archives were donated to the NY Public Library and I Think We Have A Light Out - the story of the problems with the capital lights on Unisphere. Craig has also contributed some spectacular aerial photographs of the Fair that can be viewed at The Fair from the Air. You can contact Craig via email.